Lloyds is to buy credit card firm MBNA from Bank of America for £1.9bn, in the UK bank's first acquisition since the 2008 financial crisis. Lloyds, which is nearly 7% state-owned, said MBNA would be a "good fit" with its own credit card business. 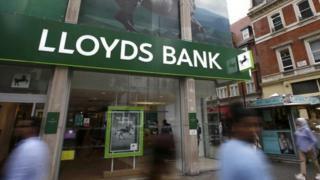 MBNA, which holds assets of £7bn, would increase group revenues by £650m a year, Lloyds said. The bank's share of the UK credit card market will increase from about 15% to 26% after the transaction. The price paid by Lloyds assumes £240m to cover claims for mis-selling payment protection insurance (PPI). Lloyds set aside an extra £1bn in October for PPI mis-selling as it revealed that pre-tax profits had fallen 15% in the third quarter to £811m. Lloyds said that MBNA would retain its own branding and cardholders would not transfer to a new card. MBNA, which operates primarily online and through mobile, would continue to have its own rates, separate from Lloyds credit cards, after the deal was done, a Lloyds spokesman said. There were several other interested parties in the MBNA business, including Santander and private equity firm Cerberus. Lloyds said the MBNA deal would bring a "significant opportunity for cost synergies", saying it expected to make savings of £100m a year, about 30% of the credit card firm's cost base in 2015.